To eliminate more than 20 overnight closures and accomplish expedited ramp work, the I-25 North Express Lanes: Johnstown to Fort Collins Project will require a full closure of the northbound I-25 on-ramp from CO 392 starting Friday, May 3, at 9 p.m., through Monday, May 6, at 5 a.m. This closure is necessary to perform multiple ramp construction activities, including removing old pavement, reconditioning the subgrade, paving a new concrete ramp, relocating the ramp metering system and adding temporary asphalt paving with striping. By conducting a full weekend closure, the project eliminates the need for multiple additional overnight closures. For detour, take East County Road 5 north to East East Harmony Road. Note: This closure is weather dependent and will be rescheduled for 9 p.m., Friday, May 10, until 5 a.m., Monday, May 13 if weather conditions prevent crews from completing necessary paving activities. Participate in our online survey for the I-25 North Express Lanes Project. Our team wants to understand how much the traveling public knows about the project, how they travel and plan to travel, and how we can best communicate. From 6 to 9 a.m., and from 3:30 to 6:30 p.m., this project provides a Courtesy Patrol to assist with disabled vehicles within the project limits. Gov. John Hickenlooper broke ground on the I-25 North Express Lanes project Monday, Sept. 10. He was joined by Sen. Michael Bennet and many local, state and federal officials who helped make this project a reality. The U.S. Department of Transportation (USDOT) has awarded CDOT and local partners a TIGER grant to help it fund this expansion of I-25 North. Download the project fact sheet. Phase 1 will allow crews to build temporary infrastructure on the southbound side of I-25. Phase 2 will push northbound traffic onto the southbound side to provide access to build infrastructure on the northbound side. Phase 3 will switch northbound and southbound traffic onto the northbound side to allow crews to build the required infrastructure on the southbound side. While most of the work will be performed outside the roadway, some nighttime lane closures will be required. CDOT will send advance notification of these closures. Current work between Crossroads Boulevard and Kechter Road, near CO 392, will continue during construction at CO 402. In late summer 2019, crews will close CO 402 between the I-25 ramps. Watch for more details in spring 2019. Once the project is complete, CO 402 will run over I-25. Increase capacity by adding an Express Lane in both directions, replacing four aging bridges and widening four additional bridges. Improve multi-modal access to regional transit to promote mode shift. Improve bus service performance and reduce each total trip time by 15 minutes by adding new bus slip ramps from I-25 to the new Park-n-Ride at Kendall Parkway. Create new pedestrian, bicycle access under I-25 at Kendall Parkway. Connect the Cache la Poudre River Regional Trail under I-25 and network to 100 miles of total trails. It will also serve as a wildlife corridor. employing congestion management and safety technology to improve overall conditions. Local partners and elected officials have been heavily involved in the planning, implementation and funding of this critically important project. 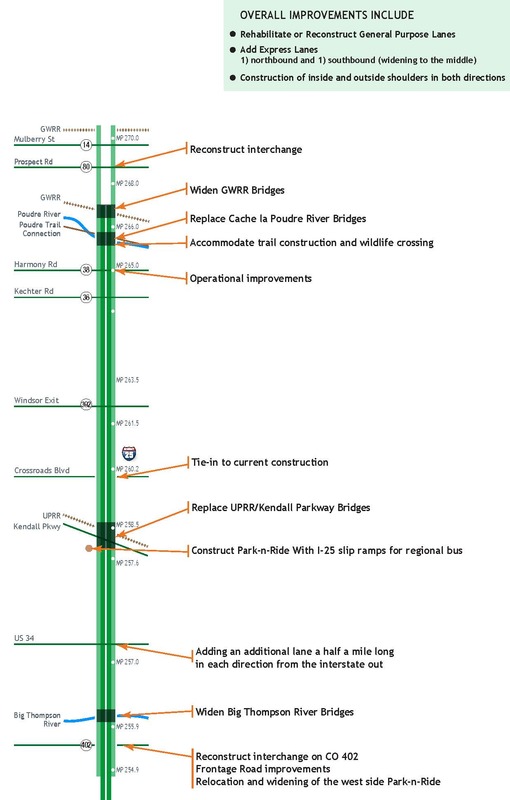 In 2013, an I-25 Coalition was formed to help manage and accelerate improvements to the corridor. Six northern Colorado communities, Weld and Larimer counties, CDOT, chambers of commerce and private businesses have all been collaborating to help bring these improvements to fruition. The I-25 Coalition has grown steadily and is currently made up of 90 representatives from Adams, Larimer and Weld counties, Berthoud, Broomfield, Dacono, Erie, Firestone, Fort Collins, Frederick, Johnstown, Loveland, Mead, Northglenn, Timnath, Thornton and Windsor, as well as CDOT, businesses and other interested agencies.